Attic Ventilation Systems - MGT Insulation, Inc.
Attic ventilation is the movement of air between the attic and the outside, usually through roof vents, gable vents, ridge vents or soffit vents. It’s important to ventilate your attic in order to keep damp air from accumulating and causing dangerous heat release issues, like mold growth. Proper attic ventilation helps release trapped super-heated air during hot summer months and helps prevent ice dams from accumulating in winter. It can also extend the life of your roof shingles, preventing damage and premature aging. Buildings with one, two, or more stories require roof vents and/or ridge vents, and soffit vents to be used in conjunction with air chutes or baffles. Homes or buildings that have additional non-full levels (such as 1 ½ story homes or 1 ¾ story buildings) may require gable and/or roof vents. No matter, what type of ventilation your home or business requires, MGT Insulation has the expertise to help. 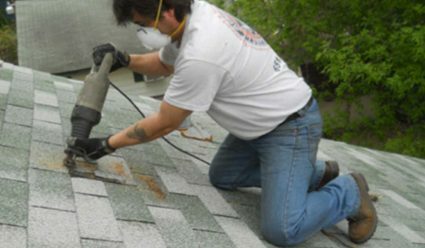 During our FREE evaluation, we’ll examine your attic and roof to discover the best option for keeping your attic ventilated and cool and to reduce unnecessary attic moisture. Our comprehensive attic ventilation process is customized to your specific needs. Learn more here.